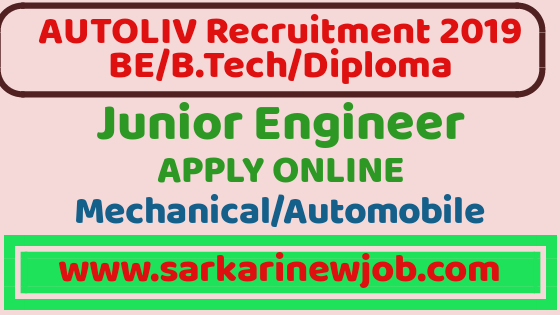 AUTOLIV Recruitment 2019 | JUNIOR ENGINEER | BE/BTech/DIPLOMA | Freshers Eligible - Sarkarinewjob.com A ultimate job portal to provide employment news. To execute Airbag Folding using CAE methods. To execute/support the CAE activities across several sites. Should be proficient in Hypermesh. Should take responsibility and ownership of the project deliveries. Should be able support and work with team. Should be keen to learn/explore new methods/processes. Should adapt to changing business scenario and should be able to work in shifts. Responsible to have an accountability in terms of efficiency and his performance. Able to understand the scope of work and execute it within the expected due date. Responsible for the quality of the deliverable of meshing and analysis projects. Should take the ownership of the tasks assigned. Should get stage wise reviewed for project/tasks with account manager. Experience: 0-2 Years of relevant experience in CAE using Hypermesh. Working knowledge of Hypermesh is an added advantage. www.sarkarinewjob.com is the first job portal in india dedicated to provide details of all the government exams from all over india .It is an exclusive career website intention to provide service to freshers who are always worried for the exams dates,syllabus, interview questions and many more.Our mission to reach every freshers who want to know about government exams in india .Our completeteam efforts will update you about UPSC, RAILWAYS JE,SSE,BANKS,SSC,GATE,IES, PSU'S,INCOME TAX,DEFENCE,LIC and other state level exams like UPPSC,MPPSC ,BPSC etc.